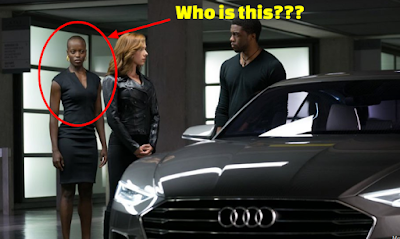 Who Is Black Panther "Security Chief" In Captain America: Civil War? If you've seen Marvel's Captain America: Civil War then you know Black Panther plays a key role in the conflict and we get several teases about his solo movie (dropping in 2018). However there's one part of the Black Panther storyline in the movie that's a bit of a mystery - Who is the fierce-looking woman who says the line "Move, or you will be moved." to Black Widow? A fan theory has surfaced that seems pretty plausible. The theory is the woman (who's only listed in the credits as "Security Chief") is a member of the royal guard sworn to protect the King of Wakanda - known in the comic lore as the Dora Milaje. In Civil War Ugandan-born German actress Florence Kasumba plays the role.